Colombian President Juan Manuel Santos has declared an “economic, social and ecological emergency” as the first victims of the Mocoa landslide were buried. The president said the government was also putting 40,000m pesos ($13.9 million) towards “addressing humanitarian priorities”. At the same time, the first funerals were taking place of the 262 victims killed in April 2 landslide. However, the hunt still continues for any survivors. The Red Cross told AFP they were still within the 72-hour window where they would hope to find people alive. However, hopes were fading among residents still desperate to find family members swept away in the torrent of mud, rocks and debris which struck the south-western town of 40,000 early on April 1. 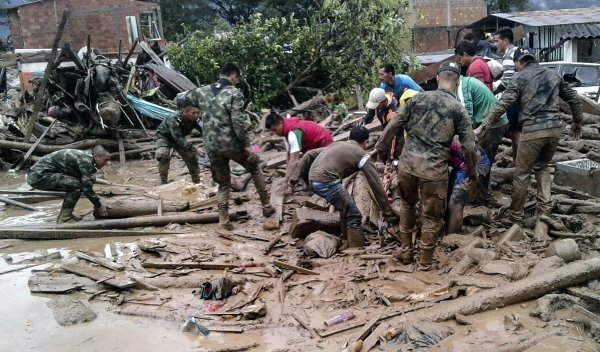 The flood came after a night of extremely heavy rain, which raised the water levels of the Mocoa River and three tributaries, sweeping away entire neighborhoods. Those who remain are now awaiting the arrival of humanitarian assistance. According to El Espectador, there was at least 40 tons of emergency humanitarian assistance on its way to the town, including 2,000 food kits and 1,000 tents. Meanwhile, President Juan Manuel Santos said 7,000 blankets and 6,000 mats had just been delivered, El Pais reported. On April 2, Colombia’s Farc rebel group offered to help rebuild the town, but their involvement has yet to be approved by the government. President Juan Manuel Santos has vowed investment will be made to make Mocoa better than it was before, and put Defense Minister Luis Carlos Villegas in charge of the rebuilding of the town. However the president’s critics said more should have been done to protect the area from such disasters.